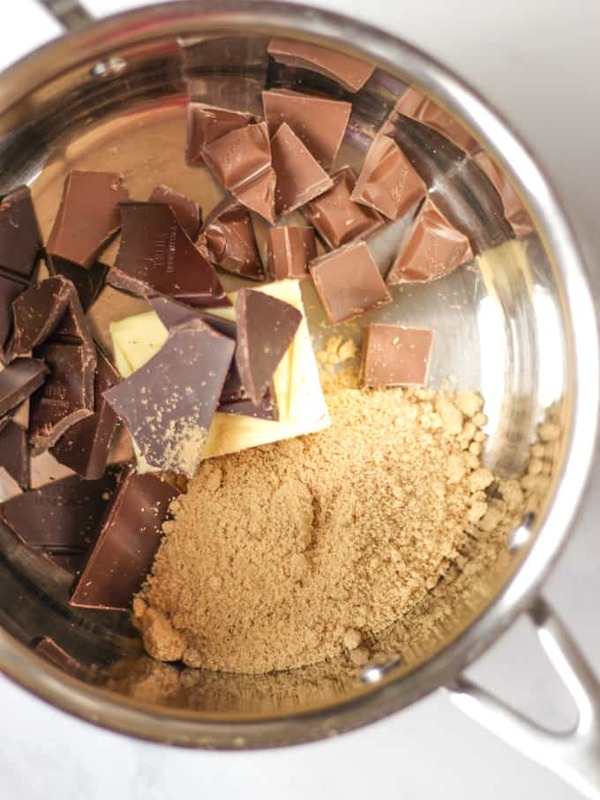 Wondering how to use up leftover chocolate? This Chocolate Brownies Recipe with Celebrations Chocolates is the perfect way to put it to good use. 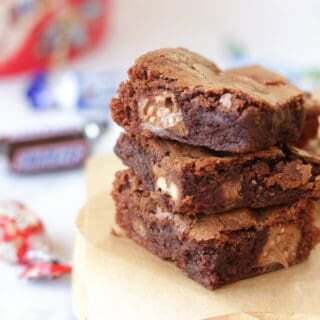 Bake up a brownie storm with this easy make. Inspired by Nigella’s classic brownie recipe, this is your go to chocolate traybake cake! Did I ever tell you about the time I met Nigella? No, I know I didn’t. It’s too embarrassing. But, it’s 2018 (HAPPY NEW YEAR!) and in the interests of self acceptance and all that I shall share with you my less than finest hour. I queued for 3 hours at a book signing. I wanted to truly convey to Queen Nigella Lawson how she had reinvigorated my sense of joy in food. How she had inspired me to unapologetically immerse myself in my kitchen life, how that love had lead to a new career and how I would be forever grateful to her for it. Instead, when I made it to the front of the queue. I uttered the profound words… “I really love your dress”. Before I was ushered off. Oh. My. Goodness. Definitely not what I’d planned, but you win some, you lose some. Nigella, although I didn’t manage to tell you, you’re forever an inspiration. Christmas has been and gone (I hope you had a rest, delicious food and found some peace?) and I’m left with a sense of excitement for the year ahead and a small mountain of Celebrations Chocolates. I need to stop nibbling so I decided to find a home for them once and for all. These Nigella inspired brownies are the perfect place for them. How to make Nigella‘s Chocolate Brownies? There’s many different ways to make brownies, often using a basic cake batter type mix, but heavy on the chocolate. 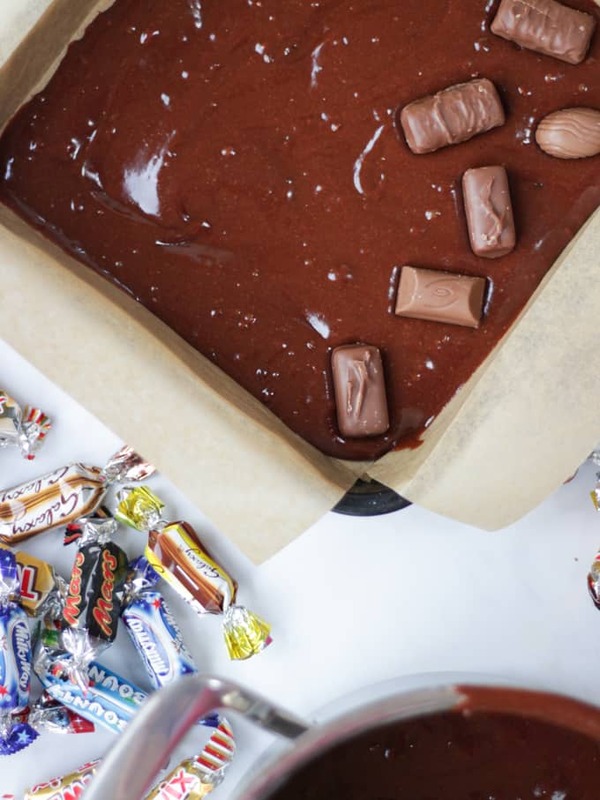 I’m so keen on this particular method as it’s just such an easy way to make chocolate brownies and quite different from your usual brownie batter. You melt the butter, chocolate and sugar, leave it to cool and then add eggs, flour and anything else (in this case leftover Celebrations Chocolates). One pan, no mess, easy peasy. What are Chocolate Brownies made of? In this recipe I’ve used my leftover Celebrations Chocolates, but you could substitute any leftover chocolate filling for the same weight. Or if you fancy a totally different change, Jamie Oliver uses sour cherries and nuts in his chocolate brownies. I’m often asked, can you freeze chocolate brownies? The short answer is – yes! After cutting them into portions, when they are completely cool, wrap in baking paper and freeze for up to 3 months. Defrost as room temperature for a treat whenever you fancy. How do you know when chocolate brownies are cooked? It’s so important not to over cook chocolate brownies. The trick is to bring them out of the oven just before they are cooked through, when they still have a bit of a ‘wobble’. Then, leave them to go cold and firm before you cut them. Voila, fudgey brownies at your service. A good small roasting pan for making brownies is a great investment. This is the one I like, the perfect size and good value for money as mine has lasted me for about 10 years so far! Masterclass Non Stick Small Roasting Pan. 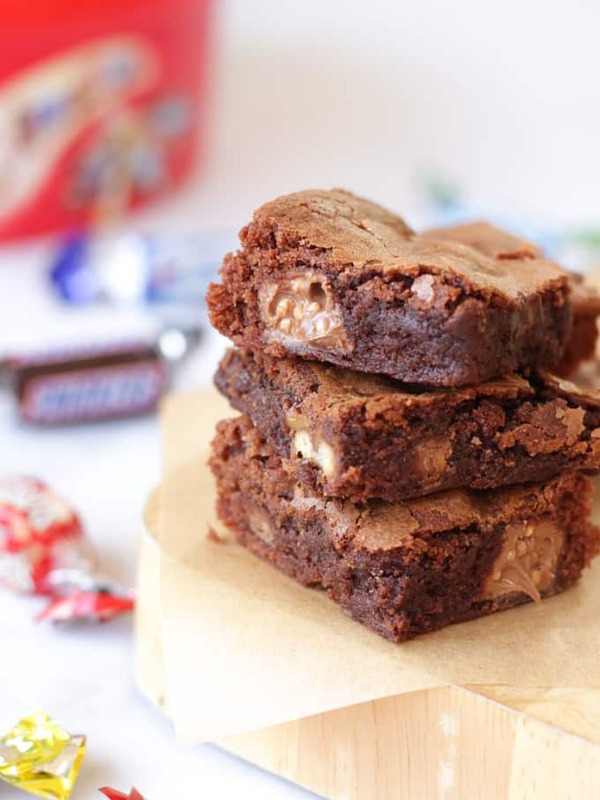 I made another version of a similar brownie for Easter here if you fancy a peek at my Filthy Fudgy Easter Brownies or if you’re short on time, how about my amazing Microwave Brownies? You can find the recipe for these Nigella inspired brownies below. Please rate the recipe and leave me a comment below if you make them. I’d love to know how you got on and what you thought of the recipe. Also, if you fancy showing me a photo by tagging me on Instagram (@tamingtwins) I LOVE to see your creations! Wondering how to use up leftover chocolate? This Chocolate Brownies Recipe with Celebrations Chocolates is the perfect way to put it to good use. 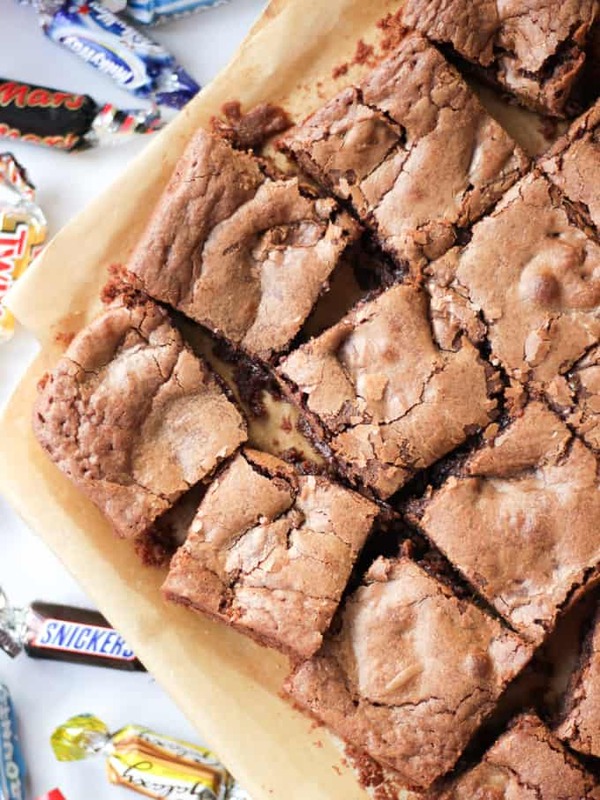 Bake up a brownie storm with this easy make. Inspired by Nigella’s classic recipe, with a few tweaks, this is your go to chocolate traybake cake! 200 g Leftover chocolate pieces such as Celebrations! Wrappers removed. 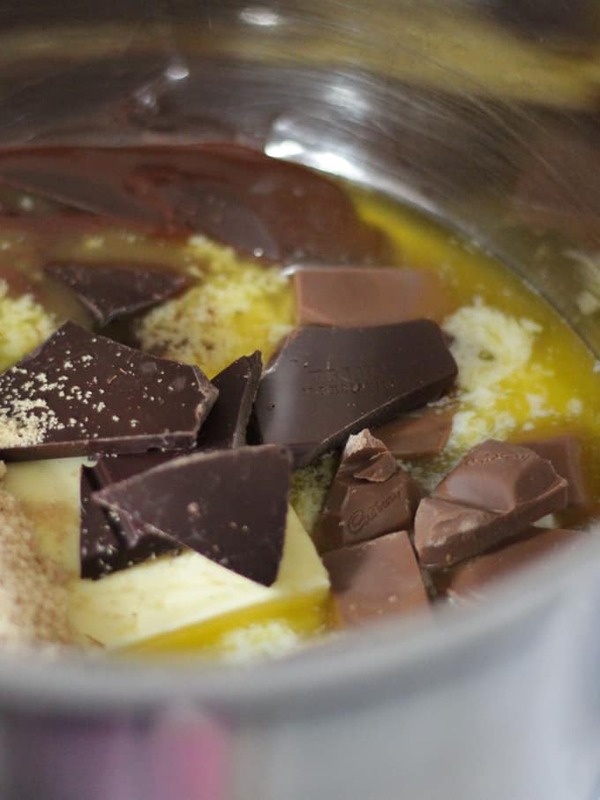 In a heavy saucepan, put both chocolates, the butter and sugar. Melt slowly over a very low heat, stirring regularly. Remove from the heat and allow to cool for 10 minutes. Add the eggs and flour and beat until very smooth and totally combined. Line a small roasting tin (about 9" square - see tips above) with baking paper. Pour in half of the batter, smooth out. Sit the chocolates on top and pour over the rest of the batter, smoothing out. Remove from the oven and allow to cool fully before cutting into pieces. Disclosure: This post was sponsored by Belling. As always all opinions are truthful. This post contains affiliate links. Love these, no chocolates are left though! !